Being one of the well-distinguished companies in the market, we are offering Wooden Stairs. 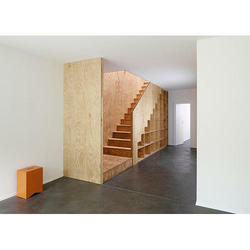 Leveraging on our vast acquaintance of this area, we are involved in providing Wooden Stair Case. These are available in different sizes and designs at nominal costs. Riding on vast volumes of expertise in this arena, we are occupied in offering Wooden Staircase. High quality solid wood ladders, material kiln dried siberian larch wood. Design can be customized according to the clients requirement..